After all the planning, the hard work, and the big decisions, it's finally time for the big event. Even though 70% of women say they spent more than seven months planning their wedding, the time can seem to fly by in an instant. 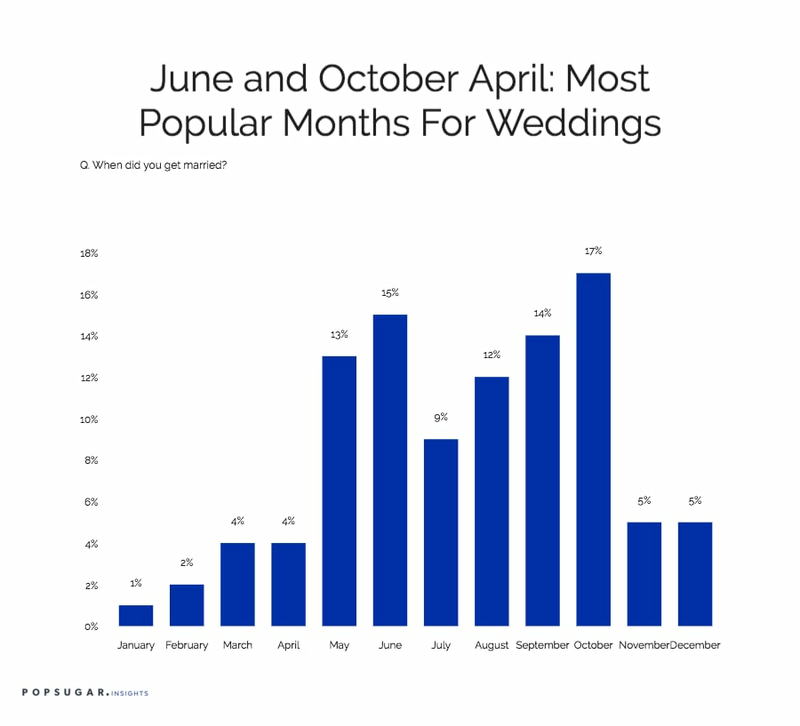 October and June are the most popular months to get married, and the most popular locations to get married included event halls (20%) and churches, synagogues, or other religious locations (18%). Women were split between having their wedding set in an urban (27%) or rustic (27%) location, and 36% of women had over six people in their bridal party, while 63% had more than four people total in their bridal party. Eighty percent of women allowed their guests to take photos and videos at the ceremony. After the vows were exchanged, 68% danced the night away to a DJ they hired for their reception, while many women said they ditched live music or a DJ for a Spotify or iTunes playlist. Besides the "Wedding March," the most popular song to walk down the aisle to was "A Thousand Years" by Christina Perri. The most popular songs to have their first dance to included "Thinking Out Loud" by Ed Sheeran and timeless classics like "Can't Help Falling in Love" by Elvis Presley and "At Last" by Etta James. Most women elected to dance in their dress, as only 15% indicated they had purchased or brought a separate outfit to change into for the wedding reception.